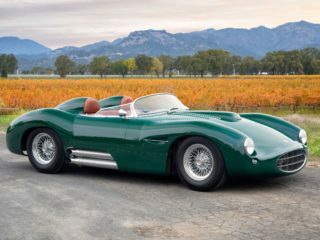 The Muntz Jet, “the first serious attempt in nearly a generation to manufacture an American sport car capable of measuring up to the top-flight European jobs“, wrote the Sport Cars and Hot Rods book in 1950 published by Fawcett Publications. The Muntz is a beautiful machine, built in practical fashion from dependable Ford and Cadillac components, with a high-grade custom body added. Father of the Muntz was the Kurtis Kraft, originally designed by Frank Kurtis, leading U.S. builder of Indianapolis and dirt track cars. 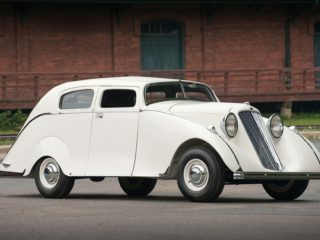 Kurtis announced a prototype in 1949, adaptable to a wide range of power units, including Studebaker, Ford, Lea-Francis (British) and Offenhauser. Complete kits for home-building also were scheduled, but production never got under way. But an experimental Kurtis sport car with a stroked Mercury engine hit 142.5 mph (approx. 229 km/h) over a measured mile on Daytona Beach in August of that year. Attracted by this performance and the low-slung lines and promising basic design of the Kurtis, Earl Muntz bought up the tools, dies and assets of the Kurtis firm in the summer of 1950. Wheelbase was lengthened 13 inches (33 cm). The existing plant was retained pending a move to a big new factory in Chicago and Frank Kurtis together with Sam Hanks were retained to do some redesigning on the original Kurtis with a view to making it an all-purpose job of wider appeal. This enabled a back seat to be installed and numerous details improvements went into both chassis and body. When we test-drove car No. 6 we used a stop watch for the pick-up figures. Example: 0-50 mph (0-80 km/h) 6 secs, 0-80 mph (0-129 km/h) 9 secs. On the turnpike, 125 mph (201 km/h) with something in hand (by speedometer). To any judge of performance, these test figures speak for themselves. Later Muntz recalled that the tooling costed $75,000 and the labor costs were a monumental $2,000 per car because body panels had to be carefully fitted, then leaded-in. Earl ‘The Mad Man’ Muntz was the a typical entrepreneur. No one knows for sure how many Muntz were made, but it’s estimated that 394 Jets were built ; of these at least 49 survive today. He began in radio in the early forties and started in 1949 selling the first televisions for mass market as a Dumont Television franchiser. As a result he made millions of dollars. Earl wanted to have his televisions in as many auto showrooms as possible and offered auto dealers huge giveaways of his televisions. In the early fifties he meet up with various prominent car dealers in the area and worked out promotions where each would share showroom space and promote each others merchandise. One such dealer was Frank Kurtis who was tinkering around with a failing self promoting sports car called a Kurtis, a general motors dealer in Inglewood California. The two discussed the possibilities of offering a new, sporty southern California type of automobile to the public. This discussion was rumored to have initiated out of learning of the Nash-Healey union in 1953. The original 28 Muntz Jet prototypes were built in Gardena, California in 1951. All had lift-off tops and Cadillacs 331 cid V8. These prototype were assembled with a mixture of current parts from other contemporary cars and custom parts. Most body panels were aluminum formed over a steel cage subframe on a ‘X’ frame chassis. The car was well received in showrooms across southern California and signups with deposits were large enough to satisfy a start of production. A numerically lower final drive ratio gave the Muntz jet a higher top speed than the Kurtis, and Muntz claimed a 0-60 mph time of as low as nine seconds. The jet was much heavier and far less agile, however. Production was shifted to Earl’s hometown of Evanston, Illinois, where the power train was changed to the Lincoln L-head V8. In the production stage, final numbers built was 366. With the prototypes from California total production was 394. Muntz lost about a $1,000 on every Jet he sold, the main reason he gave up on the venture after four years. Earl went on to develop the 4 track and 8 track tape car stereos and continued to promote the large big screen TV’s when first developed in the early eighties. I personally have seen only one in my life and that was some years ago up in the San Francisco Bay area. A gentleman I met through a friend in Los Altos, California had one which he had bought in 1962 for 500 dollars. He knew what he had in 1962 and had stored it for many years. It was the original red with white interior and the Kelsey-Hayes Wire wheels were in perfect shape. Today they range from $10,000 for a fair condition on to up towards $40,000. Engine is a slightly modified L-head Lincoln V8 producing 154 hp. Zero to sixty time was tested as 6.7 seconds, zero to eighty was 9.9 seconds, top speed 119 mph. Wheelbase was 116″, length 181″, width 38″, height 54″, and the car weighed in at 3300 pounds. The Muntz Jet had individual front seats with safety belts. Earl Muntz produced in the region of 400 Jets between 1951-54. It was a 4-seater convertible in the mold of the 58-61 T-bird. He bought the design from Frank Kurtis and redesigned & re-engineered it. 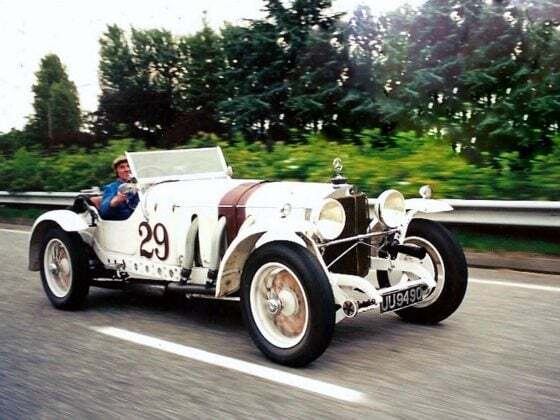 The first 28 cars were powered by a 331 cid Cadillac V8 and were made of aluminum, with a 113 inch wheelbase. This first batch was built in Glendale, California. Subsequently, production shifted to Evanston, Illinois, with a steel body and a Lincoln flathead V8. The very last cars used fiberglass front fenders and an ohv Lincoln V8. Muntz estimated that he lost USD 1,000 on every car he built ! When I say the name “Earl Muntz“, what comes to mind ? Unless you lived in California in the 1940’s or 50’s, or you are a true student of pop culture, your most likely response is “Nothing“. Too bad, because Earl “Madman” Muntz was one of the most interesting practitioners of the art of hucksterism that America has ever known. He was a self-taught engineer, an outrageous personality, and the inventor of the Muntz Stereo-Pak 4-track system, the direct ancestor of our beloved 8-track. Muntz was a high school dropout and a tinkerer. Like Bill Lear, the father of 8-track, Muntz’s tinkering led to some great machines. Lear had his Lear Jet and Muntz created the Muntz Jet, a souped-up sportscar which sold for $5,500 (big, big bucks in the early 1950’s). Like Lear, Muntz was an audio nut. According to Billboard, he developed the first known car stereo, a 110-volt system that was modified to run on the car’s own battery to avoid the risk of electrocution. Earl Muntz started out as a used-car salesman. 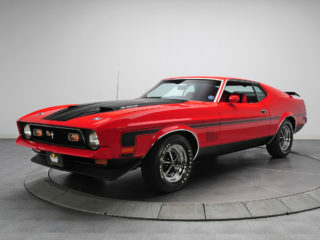 Before long, he began appearing on radio and television to promote his cars, and that’s when his real notoriety began. Muntz is usually credited with starting the “this guy’s insane, come take advantage of his crazy prices” school of salesmanship. In some of his commercials, he would promise to take a sledgehammer and smash a car on television if the car wasn’t sold that day. “I buy them retail and sell ’em wholesale – it’s more fun that way!“. Earl Muntz would do anything for publicity. During the height of the McCarthy era, he contemplated joining the Communist Party in order to get more exposure. He dressed up in red longjohns and a Napoleon hat, probably both as a caricature of the cliche of crazy people with Napoleonic delusions and as a representation of his plans to conquer the market. Bob Hope and Jack Benny used his name as a punch line, tour buses regularly stopped at his lot, and in 1943, pranksters at the Rose Bowl spelled out his name at halftime. Muntz made $72 million in the car business, and in the process he became a celebrity. Muntz went from cars to televisions (he named his daughter Tee Vee, although she is usually known as Tina) and distinguished himself in this field both by making a fortune and by skimping on components in order to keep his prices low. Engineers of a certain age still refer to the practice of “Muntzing“, which means reducing something to the absolute minimum number of parts it requires in order to run. Car audio was the next world Muntz set out to conquer. In the early 60’s, he started producing the Muntz Stereo-Pak, a 4-track system. Muntz was famous for walking up to his engineer’s workbenches and snipping out capacitors that he considered to be “extra” (the Muntz of legend always carried a pair of insulated nippers for just such occasions). Bill Lear took a ride in a car with a Muntz stereo in 1963. He was so impressed that he immediately drove over to see Earl Muntz and signed a distribution deal. Lear installed Muntz players in some Lear Jets, and he began taking the players apart and finding ways to improve upon their design. And so the 8-track was born. Earl Muntz died in 1987. At the time of his death, he had shifted the focus of his business to cellular phones. There were many other schemes in between, projection T.V.’s and aluminum houses, to name just two. Muntz was married seven times, and until the end, he drove a custom Lincoln Continental with a TV built into the dashboard (he claimed it helped him to drive better). The Muntz name lives on, way beyond his death. Muntz made and lost a fortune in the automobile business, first selling used cars to service men returning from World War II and later as a Kaiser-Frazer dealer in Chicago. In the annals of automotive history, there have been few hucksters, snake oil salesmen, and promoters as bizarre as Earl “Mad Man” Muntz. After WWII you could sell anything with wheels, and the Mad Man did a good job of it. As Kaiser-Frazer’s future dissolved, Muntz turned his attention to television and stereos, marketing the Muntz TV, an entry-level home television, and the Muntz four-track stereo, which he sold to Bill Lear. It wasn’t enough to sell TVs and used cars; Muntz wanted to be in the manufacturing business. About this time, race car builder Frank Kurtis designed and built a two-seat sports car that featured a modern American V8. Kurtis was pressed for funds ; Muntz had money and bought the design. Early cars were two-seaters, but soon after the acquisition, Muntz had the cars stretched into four-seaters, powered by a Lincoln flathead V8. The first cars were built in Glendale, California, but production later moved to Muntz’s hometown of Evanston, Illinois. Muntz maintained residences in L.A. and Chicago, and through his flamboyant sales pitches, he was known far and wide. He was a self-made celebrity who named his daughter “TeeVee” to promote his later endeavors. Muntz employed actor Victor Mature to hawk his cars to the stars and his TVs to the workers on the movie sets. The Glendale cars featured aluminum fenders, hood, and deck lids, and flathead Lincoln V8s with Hydramatic transmissions. Muntz Jet serial numbers were erratic but estimates range as high as 394 cars being built. Later cars were all steel, and a few of the last had fiberglass fenders. Mature was good at his job, and many celebrities bought Muntz Jets. They included Ed Gardner (Archie from the radio show “Duffy’s Tavern”), Mickey Rooney, Mario Lanza, Grace Kelly, Western star Lash LaRue, orchestra leader Freddie Martin, actress Gloria DeHaven (a pink one), and radio personality Alex Drier. To own a Muntz in 1950s Hollywood was a big deal. The list price was $4,500, which was big money, and for that you got a sleek sportster with either a Lincoln or a Cadillac engine. Wild interiors could be synthetic snake or iguana skin, or leather, and you could get a Carson lift-off top, Appleton spotlights, and an engine-turned instrument binnacle with Stewart Warner gauges. The choice of colors was up to the customer, but by and large, they were wild pastels, purple, blue, salmon, pink. Two Muntz Jets were sold at RM’s Phoenix Auction on January 19, 2007. The stock 1953 car shown here netted $68,750 ; the customized 1952 Muntz went for $134,750. I’ve owned Muntz s/n M243 for over seven years. It’s metallic purple with a white synthetic iguana skin interior. Mine is an Evanston car with a flathead Lincoln and is purported to be the Grace Kelly car, for whatever that is worth. It cruises pretty well in a straight line, but corners like a barge and stops about as quickly as a Forrestal-class aircraft carrier at full speed. A Muntz has a mixed personality. It can be a sports car (albeit a soft one), or a Hollywood custom, low, sleek, and a bit absurd. It is estimated that there are 50 or so driveable cars left, and those who own them are passionate about them. Three individuals I know, Gerry Sutterfield (West Palm Beach, FL), Don Marsh (Columbus, OH), and Alex Quattlebaum (Charleston, SC), all own multiple examples. Perhaps they know something the rest of us have missed. The two cars sold at RM’s Phoenix auction are really different and represent the broad price range of Muntz cars. The customized car that was built for orchestra leader Freddy Martin (5M-246) was restored to a fine level. It was shown at Amelia Island in 2006, and although the styling is a bit over the edge, the car is perfect. The $134,750 price was really strong, but perhaps I’m a bit out of touch in this market. On the other hand, this car, built for Gloria DeHaven, was in fair condition. At $68,750, and though missing some trim pieces, it represents a good buy for a rare piece of Hollywood history. With ’53–’55 Corvettes bringing over $100,000, and in some rare cases, over $200,000, a Muntz is a bargain, and much rarer to boot. Parts are relatively easy to find, as the running gear, suspension, and many trim pieces (door handles, windshield and quarter window frames) are all 1949 to 1951 Ford. Engines are either Lincoln (both flathead and pushrod) or Cadillac. There was at least one Chrysler Hemi-powered Muntz. Hubcaps are Cadillac sombreros with Muntz center discs, and the bumpers were adapted from a GMC bus. On most cars, the parking and taillights are modified Chevrolet pickup. These cars are subject to rusting, and the doors have a tendency to sag, so it behooves a potential buyer to check carefully under the car at the floors and to examine the door fit. The side windows and top never did fit very well. 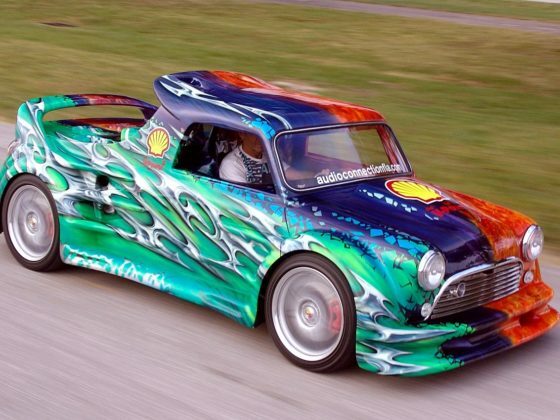 For not-crazy money, Muntz cars offer a chance to make an individual statement. You’re buying a near-custom creation, but with more appeal than a pure one-off. It’s powered by a bunch of Ford and NAPA parts, so keeping it running will never be an issue. Most important, every time you drive it, you remind the world of one of America’s flamboyant entrepreneurial personalities. 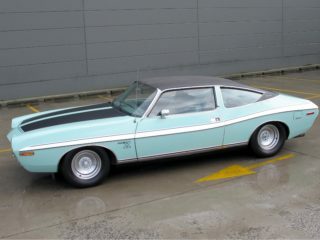 Frank Kurtis, creator of the Kurtis Sport, was famous for high-performance sports cars long before Colin Chapman or Carroll Shelby appeared on the scene. A chassis designer of enormous skill, he built a series of highly competitive racers beginning in the Twenties, many of them dirt-track midgets powered by that favorite engine of speed merchants everywhere, the flathead Ford V-8. He’d go on to even greater fame in the postwar era with formidable Indianapolis cars that would win the fabled “500” four times between 1950 and 1955. But like Chapman and Shelby, Kurtis couldn’t resist applying his competition know-how to a street sports car. His first attempt was the Kurtis Sport of 1948, a slab-sided two-seat convertible that Motor Trend magazine said had all the features a sports car should have : speed, maneuverability, acceleration, power, and sleek looks. Unusual for the day, its chassis was integral with a body comprising 10 panels, all aluminum except for hood and rear deck, which were fiberglass. Appearance was bulbous but pleasing, aided by a tight 100-inch wheelbase, 169-inch overall length, and 68-inch width. A simple bumper/grille with large guards was mounted on rubber shock absorbers, a forecast of the “safety” bumpers we’d love to hate in the 1970s, and there was a full-perimeter chrome rub rail for bodyside protection. Side windows were clumsy, clip-in Plexiglas affairs, but a removable rigid top was included besides the expected soft top. Within the handsomely furnished cockpit was full instrumentation arrayed directly ahead of a big steering wheel on an axially adjustable column, another predictive feature. Like interior hardware, the Kurtis Sport’s suspension and running gear were mostly proprietary components, though Frank tuned spring and damper rates for optimum handling and roadholding. The powerteam was anything the buyer wanted, though 239-cubic-inch Ford flatheads with Edelbrock manifolds were fitted to most examples. A kit car was also available at prices ranging from $1,495 to $3,495 depending on completeness. Light weight gave the Kurtis Sport good go despite the flathead’s modest power, and reviewers loved the car’s nimbleness and stability. But Kurtis-Kraft was a small outfit, building cars largely — and slowly — by hand, so sales were as sparse as profits. After seeing just 36 Sports out the door through 1950, Frank sold his Glendale, California operation for $200,000 to Los Angeles used-car dealer, radiomaker, and pioneer TV pitchman Earl “Madman” Muntz, who stretched the Sport into a luxury four-seater and sold it with Cadillac or Lincoln power. 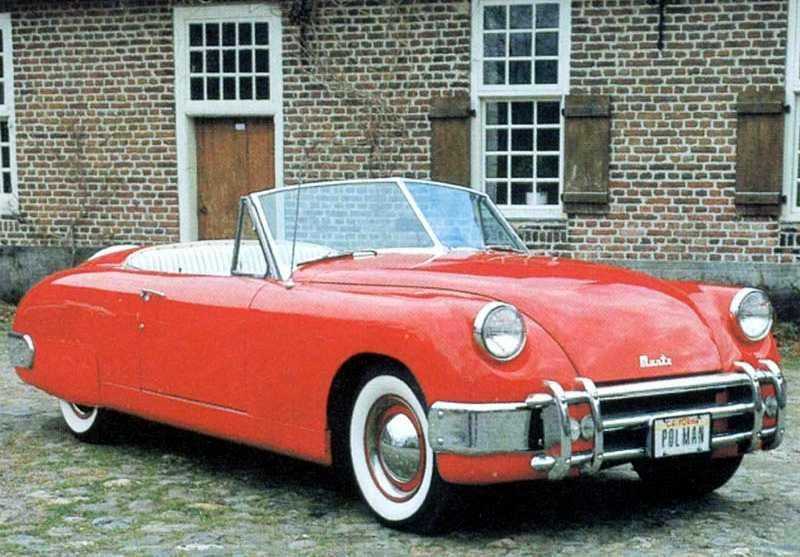 Called Muntz Jet, it garnered just 349 orders through 1954, forcing Muntz to bail out too. But Kurtis hadn’t given up on a series-production sports car. In 1954, his Kurtis Sports Car Corporation produced 50 chassis based on the tubular 500KK design with which Bill Vukovich had won the 1953 Indy 500. Some 30 of these were sold to individuals who clothed them in various aftermarket bodies, but the remainder got fiberglass roadster coachwork, supplied by McCulloch Motors, and Cadillac running gear (also used in a few Sports). The result, tagged 500M and priced at $5,800, looked something like a scaled-down ’54 Buick Skylark but had roughly rectangular bodyside recesses, usually finished in a contrasting color. 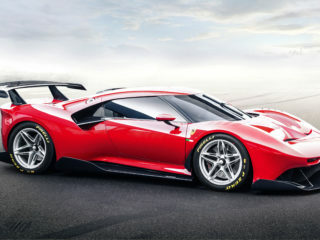 Wheelbase and track dimensions (56 inches front and rear) were the same as the Sport’s, but curb weight was about 200 pounds higher. And fast it was: up to 135 mph with the standard GM Hydra-Matic. It, too, was sold fully built (at around $5,000, depending on running gear) or as a kit (in four stages of completeness). Also in 1954, Kurtis fielded the 500S, a stark, Allard-like dual-purpose roadster designed mainly for road courses and dirt-track ovals. The S enjoyed great success in the hands of owner/driver/mechanics like Bill Stroppe, whose flathead-Ford-powered car beat a lot of high-priced foreign machines in 1954 West Coast events. Vukovich, still in the Kurtis he’d first driven at Indy in 1952, won the 500 again in ’54, while seven other of Frank’s cars finished in the remaining top nine places. Alas, Kurtis’ greatest triumph would be his last, for he soon turned to more mundane endeavors, including the construction of airport service vehicles. Some of those undoubtedly ended up at Los Angeles International, where Carroll Shelby would set up shop in a few years. But that, as they say, is a whole ’nuther story.